Yes, one of the strangest seasons in club soccer history came to a thrilling and unpredictable end yesterday evening. The match started off predictably enough, with Atlético Madrid pressing high and making life extremely difficult for Real Madrid. Within the first few seconds of the game they fouled Casemiro, and then only minutes later did the same to Pepe. With their presence felt, Atleti unleashed a flurry of press traps that diverted the ball where they pleased, stifling Real’s build-up play in the process. For Diego Simeone, everything was going according to plan, until it all went out the window in the 15th minute. From about 40 yards out, Toni Kroos stood over the free kick before sending in a ball that just barely nudged the man-bun of Gareth Bale and descended just in front of Jan Oblak, where Ramos' tippy toes were there to meet it just softly enough to poke the ball past the goalkeeper. It was goal written directly from the Atletico playbook: a set piece with a pinch of good luck. From that point to the end of the half, Atleti seemed rattled. Luca Modric was given acres of space to operate, often holding up possession, keeping the opposition out of any semblance of offensive rhythm. Dominating the possession battle, you would have expected Madrid to unleash its horses and kill the game off, but you would’ve been wrong. They almost appeared satisfied with their lone accomplishment, spending the rest of the half passing it around with no direction or purpose. During the halftime break, Simeone knew he had to do something, so he replaced Augusto Fernandez and threw on Yannick Carrasco, while switching to a straight-forward 4-3-3 more suitable for attacking. With his back to goal, Torres received service from Griezmann, and was met by Pepe who Sasquatch stomped the Spaniard right above the ankle for a clear penalty. Griezmann stepped to the spot with the confidence of a Las Vegas blackjack dealer, but his shot blasted off the top bar and all of Madrid (well, half of it) exhaled. Moments later, a Madridistas worst nightmare was realized as Dani Carvajal bowed out to muscular problems and Zidane had no choice but to send on Danilo. The Brazilian has had a tumultuous first season at the Bernabeu, and it was about to get a heck of a lot bumpier against Carrasco, whose combination of strength, quickness and ball sorcery gave Danilo fits until the final whistle. Atleti were now dominating possession to a degree I didn’t think was possible, threatening the goal of the Costa Rican Navas. First, Savic's awkward finish just graced wide after a mad scramble in front of the net and then Saul hooked Carrasco's cross just wide of the post. With the water nearly reaching boiling, Zidane felt he needed to do something, so he took off Benzema and Kroos in the span of four minutes, and replaced them with Isco and Lucas Vasquez. It appeared the chess move was about to work when, with the ball bouncing around the Atletico box, Ronaldo and Bale pounced like cheetahs, each taking a blast that ultimately reached the shins of defenders before bouncing to safety. Atleti went on the counter, with the ball falling to Gabi, whose world-class chip found Juanfran. The full-back's first-time cross found Carrasco, who had left Danilo and Vasquez so badly in the dust they were coughing, at the far post to turn the ball past Keylor Navas. It was a beautiful goal, sending their supporters into a bedlam of mosh pits reminiscent of Woodstock 99. The same couldn’t be said at my watch party, full with over 400 Madridistas, who felt the karma of the 2014 final was back to collect. Luckily, in the last 20 minutes muscles began to tighten and lungs gasped for air. It was off to extra time and the primary objective was clear. Now, it’s about fighting off fatigue, both mental and physical. No two players were feeling the affects more than Real’s most expensive wingers. Ronaldo was laboring to the point of walking up-and-down the pitch, and Bale, who was so good for the first 90 minutes, began to succumb to his old nemesis: fragile calves. Still, both teams were able to keep their concentration and avoid any fatal mistakes, extending the match to a dreaded penalty shoot-out. For neutral observers, a penalty shoot-out to decide a cup final may very well be up there with some of the most exciting spectacles in sports. Pretty much the equivalent of eating old, white dog poo (not that I’ve done that or anything). With clenched teeth, and the only visual coming through the cracks of the fingers covering my eyes, both sides stepped to midfield forming the customary human chain link fence. The first eight penalties were flawless, including one from Griezmann, who cooly atoned for his earlier miss from the same spot. Atletico fullback Juanfran was lucky number 9. His shot was low and to the left. Keylor Navas had guessed right, but the shot was always going to be out of his reach until a loud thud echoed through television speakers everywhere. It had hit the post, and up walked arguably the greatest goal scorer in history. Ronaldo, with the opportunity to win club soccer's greatest prize with the final kick of the game. For 120 minutes, a man who has never been invisible was just that, but it didn’t matter. He knew this chance was coming and he relished it. "I had a vision," he said. "I knew that I would score the winning goal... I told Zizou that and to let me take the fifth and that's how it turned out." In his customary gunslinger pose, Ronaldo stepped and fired a missile into the top right corner. He ran to the far left corner and, as if needing any excuse, ripped off his shirt, making 90% of the world's men depressed in the process. 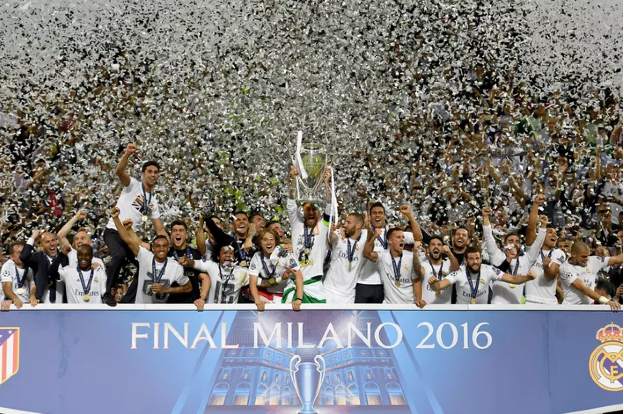 Real Madrid had won their 11th European Cup, now four more than second place AC Milan. Atletico could do nothing but bow their heads in shame. Another slow and arduous death, equivalent to being stabbed and having your murderer stare straight into your eyes all the way to end. "The winner is always right," Simeone said. "We weren't good enough to win it on penalties. Justice? I don't believe in justice when it comes to football. There's only winning and we lost. The better team won. The better team always wins." A season once on the brink of disaster for Real Madrid has astonishingly been saved by an inexperienced manager who, 150 days ago, was managing the Castilla side in Spain’s third-division. Now, he is champion of Europe, and the first man to win the European Cup as a player, as an assistant and as a manager. What comes next for both of these clubs remains to be seen, especially Atletico. Asked after the match whether he wanted to continue as manager, Simeone was non-committal. “Do I have to continue with Atlético or is it the end of a cycle? I have to think about that,” Simeone told a news conference. “It’s a logical question for you to ask after a defeat like the one we’ve suffered today. For Real Madrid, a period of sustained success and stability is the next step to take. A frustrating eight-year spell, despite vast expenditure, has brought two Champions League titles but just one league trophy. But for one night in Milan all was right with the club. President Florentino Perez proclaimed Ronaldo “would be at Real forever,” Isco and James Rodriguez had forgotten about a lack of minutes, and supporters were hugging and buying drinks for complete strangers.